More images of York in the ‘golden age of motoring’, towards the end of that age. Clearly it’s some time ago, before so many people were converted to the vision of freedom offered by the car that the roads got choked up and gridlocked and no longer offered freedom. Now we pedestrians are the ones appreciating our freedom, often walking faster than the queues of traffic can travel on the roads immediately around the city’s centre. Pictured above, in the 60s/early 70s, is the corner of Piccadilly (which is off to the right) where it meets Tower Street. Petrol pumps on a garage forecourt (enlargeable, as are the other photos). Not far away, another hotel now occupies the site of this garage. If you were driving from the site of the previous photo to this one, you’d bear left, cross the Foss, to the roundabout, and take the second exit (or turn right, pre-roundabout), and you’d pass Clifford’s Tower on your right, and just after it turn right, and then perhaps pull in to the Castle Garage, which displayed the rather elegant-sounding name of ‘Cornelius Parish’. On the right: Fairfax House, pre-restoration. The spire of St Mary’s Castlegate is in the background. Between them, the chimney closest to the spire is perhaps part of the Craven’s factory on Coppergate, where the Coppergate Centre is now. Clifford’s Tower is behind us – this was taken from its mound. I’d like to know more about the building made of stone which looks like a converted chapel. Anyone know more? The same site, from a different angle, taken from the end of Castlegate near the entrance to the car park. Small-scale, human scale, nice curved corner. Changes? Not just the obvious, that the garages have been replaced by hotels. The new buildings replacing these are much taller, making most use of the valuable city centre space. Less light reaches the wandering pedestrian and the queuing motorist. And as with the previous page of photos, these illustrate a fundamental shift in the way we use places and the way we ‘journey’, and for what. 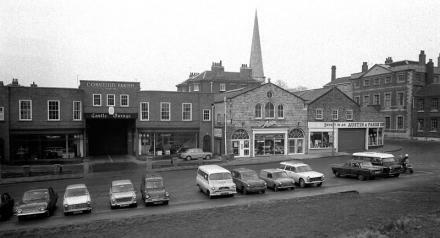 In the period pictured the city centre was the place where residents could find everything they needed. Now, residents beyond the historic core/city centre are better served by the out of town shopping centres at Clifton Moor, Monks Cross and the Designer Outlet. Supermarkets in out of town locations provide petrol alongside the weekly shop. By Lisa @YorkStories • 1 March 2013 Rail, roads, rivers, Roads, traffic To link to this page's proper location please use the > permalink. You’re right Ian, just looked it up on old-maps.co.uk. Wow. Manchester has the only other Free Trade Hall I’ve ever heard of. All rather mysterious though, as despite searching online I can find no further information on York’s Free Trade Hall.